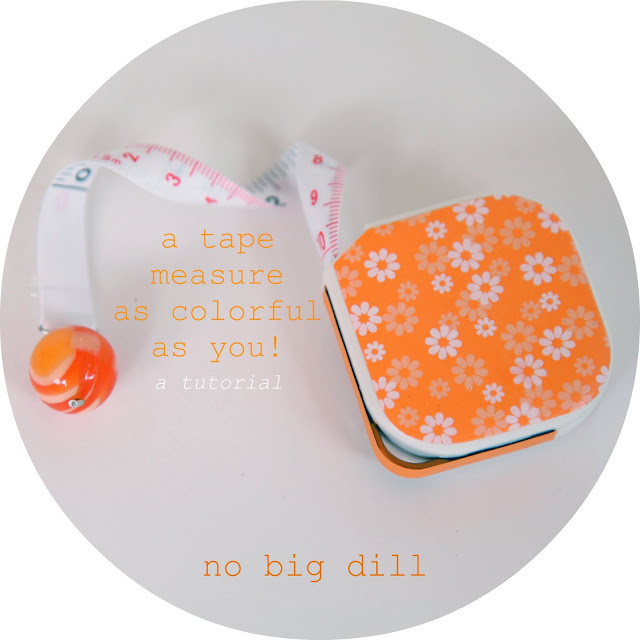 no big dill: NEO: a tape measure as colorful as you! NEO: a tape measure as colorful as you! My sewing tape measures always have a habit of ending up in some baby dill hands, being stretched across the room, wrapped around stuffed dogs, and turned into tug-o-way games. Usually they're cheap ones that were either in the 99¢ bin or free with a giant logo slapped on the side. I vowed that I was going to devote a tape measure to staying put in my sewing drawer. A friend for my happy pins and the next installment of my never enough orange [NEO] series. Are we tired of orange yet? I didn't think so. I love walking into this room because it's instant happiness! You can do this with a round tape measure as well, just adjust the tutorial by tracing the shape of your own tape measure, and a round one might actually be easier than a square tape measure with rounded corners plus a little cut-out corner! Yes, I like to complicate everything. I'm not a heavy Mod Podge user, in fact today is the second time using it, and I used it twice! Exciting day at the dills! I was so pleased to find it in mat. Paint-to touch up any remaining colors you can't cover with paper. I'm a huge fan of nailpolish for small projects because it comes in such a wide range of colors. Trace the tape measure on the back side of the origami paper. I ended up cutting it out and then trimming it down a bit more so it didn't have to curve around the edges. For the button, I rubbed my thumbnail on the paper to get an imprint. Cut out the imprint for the button very carefully with small, very sharp scissors. Paint Mod Podge on the back of the printed paper and place carefully on the tape measure. Paint another layer over the paper, smoothing down the edges. I also cut a strip out for the loop along the side and used the nail polish to paint the tiny edges that I couldn't cover with paper. Originally I was going to paint the pull on the end of the tape measure, but then thought I could do something so much more exciting, so I clipped it off with wire cutters. I took two jewelry pins and thread them through a large plastic bead. Make sure the hole is big enough for this task! Bend them in the shape of a hanger and thread through tape measure opening, clipping off the remaining pin. Now you'll just want to go around measuring your books and your head and your husbands toes and your vegetables! And I enjoyed some time actually sewing yesterday and I have a new sewing project love. It just might turn into an obsession, [because my obsession with orange isn't bad enough ;)] which is fine when you have 5 little girls to sew for. Right? I'll share soon. You're killing me with all the Korean products that you use! I LOVE origami paper. I used to have my friend send me some from Korea because it's impossible to find as cute ones in the States. Ah - love love it. One of my tape measures is currently strung between two dining chairs as it is being used as a washing line for teddy's clothes! Ashley-I'm sorry, it is rather rude of me. so cute!!!! there is never enough orange!!! Really fun! The bead was such a superb idea! My sewing room is becoming a bit jealous! I have a measuring tape that came OUT of my old retractable one when a small child "helped". I love your decorator version. My measuring tapes are forever being used as leashes for stuffed animals. Oh I love it. I should do this too. In fact...I may have a teensy one that stays in my purse that needs to turn pink to match! And I can't wait to see your new obsession. Obsessions are great because it means we're passionate about what we do! You crack me up! Hey, do you know that Similac Sensitive (baby formula) comes in a white plastic tub with a very ORANGE lid. If you have a friend who needs to feed their baby Sim Sensitive, ask them to collect their tubs for you. You can sanitize them and use them for neat-o storage! 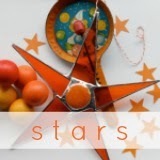 Now I too am starting to think only in orange images. Whew! Yay for Mod Podge! I love your blog, because I've been sewing since I was 11, but I run a Mod Podge blog so most people don't know that. :D I would love to feature you! !